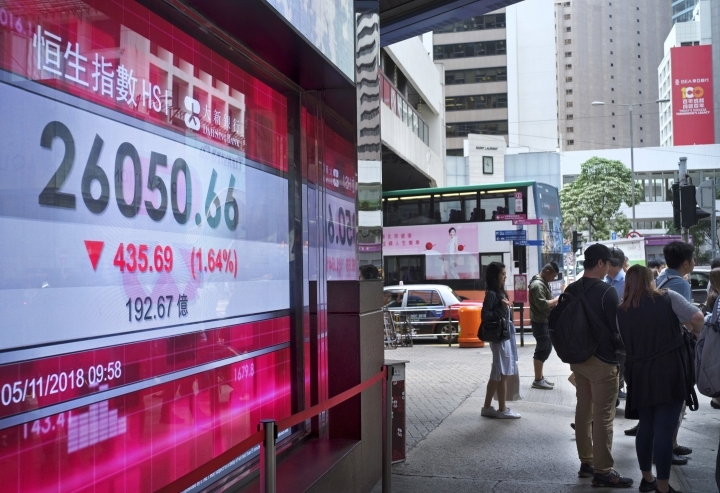 SINGAPORE — Asian markets tumbled Monday as traders feared that President Donald Trump only reported progress in trade talks with China to score political points as the U.S. midterm elections draw near. WALL STREET: Technology stocks slumped on Friday as Apple reported poor earnings and said it would stop disclosing quarterly iPhone sales. The company's stocks gave up 6.6 percent to $207.48. But high-growth stocks rose after the U.S. and China said they had made some progress in trade talks. The S&P 500 index dropped 0.6 percent to 2,723.06 and the Dow Jones Industrial Average lost 0.4 percent to 25,380.74. The Nasdaq composite, which has a high concentration of technology companies, slipped 1 percent to 7,356.99. The Russell 2000 index of smaller-company stocks added 0.2 percent to 1,547.98. 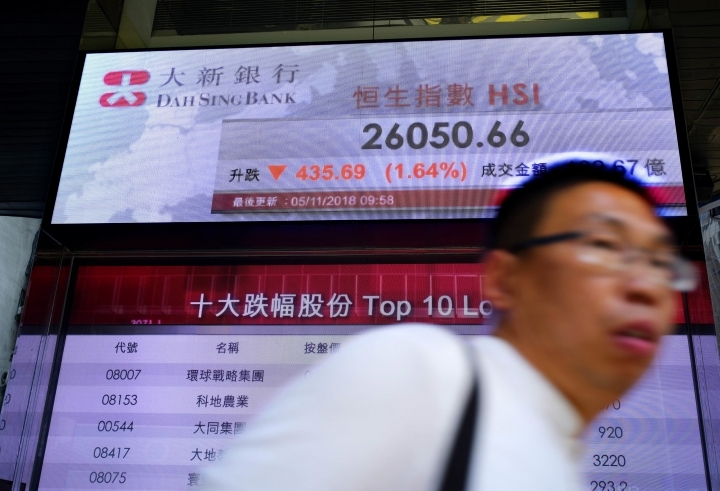 US-CHINA TRADE: Global markets rose Friday after President Donald Trump said that he talked to his Chinese counterpart Xi Jinping about trade. Trump added that the discussions were "moving along nicely" ahead of a planned meeting at the Group of 20 summit later this month. Larry Kudlow, a top White House economic adviser, later said "there may be a little thaw going on here." The two countries have already imposed tariffs on billions of dollars' worth of each other's exports and there are hints of more to come if relations do not improve. A Chinese foreign ministry spokesman agreed that the leaders had a positive phone conversation, without elaborating if they had made progress on an escalating trade dispute over Beijing's technology policy. 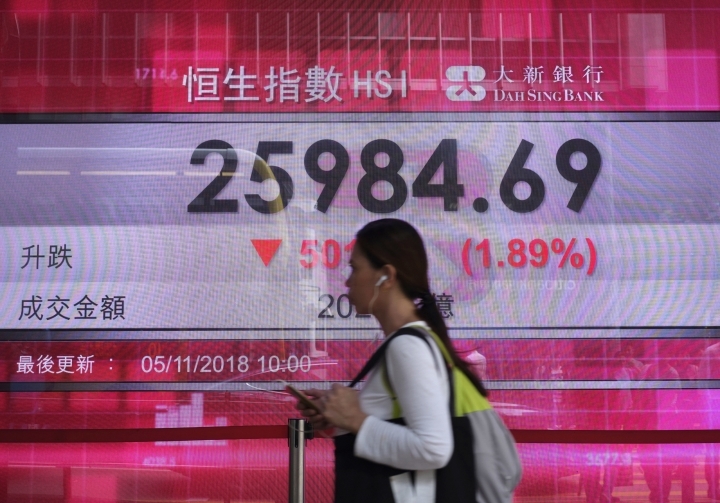 ANALYST'S TAKE: Different takes by U.S. officials on the progress of trade talks with China kept "political uncertainty boiling," Stephen Innes of OANDA said in a market commentary. "Investors are far too wary of an empty promise, but ultimately, they will need to decide how much of President Trump's olive branch to China was a ploy to boost equity markets ahead of the U.S. midterm elections on Tuesday and how much of it is a bona fide attempt to reach an agreement," he said. ENERGY: Oil prices fell as the U.S. defended waivers given to eight unidentified nations, which will be able to continue importing Iranian oil after the re-imposition of sanctions. Benchmark U.S. crude dropped 48 cents to $62.66 per barrel in electronic trading on the New York Mercantile Exchange. It lost 55 cents to $63.14 a barrel in New York on Friday. Brent crude, used to price international oils, lost 42 cents to $72.41 per barrel. The contract shed 6 cents to $72.83 a barrel in London. CURRENCIES: The dollar eased to 113.18 yen from 113.19 yen late Friday. The euro was flat at $1.1387.